Marbella coastline has a wide verity of beaches for all tastes and ages, where you can usually find good space to enjoy the sun, relax or having fun. The 27 kilometers of coastline within the limits of Marbella is divided into twenty-four beaches with different features; however, due to expansion of the municipality, they are all now semi urban. They generally have moderate surf, golden or dark sand ranging through fine, medium or coarse in texture, and some gravel. The occupancy rate is usually high to midrange, especially during the summer months, when tourist arrivals are highest all along. The various notable beaches are Artola beach, situated in the protected area of the Dunas de Artola, and Cabopino, one of the few nudist beaches in Marbella, near the port of Cabopino. The beaches of Venus and La Fontanilla are centrally located and very popular, and those of Puerto Banus and San Pedro de Alcántara have been awarded the blue flag of the Foundation for Environmental Education for compliance with its standards of water quality, safety, general services and environmental management. All of the beaches have good facilities, like beach bars, beach clubs and enough space for parking. Marbella is also home to some of the most famous beach clubs like Nikki Beach, Ocean Club, Puro Beach and Buddha Beach Club. But there are also a lot of Chiringuitos, a mix of Bar and restaurant in a typical Spanish style, where you can enjoy eating fresh fish and seafood or have a cocktail and rent a sunbed to enjoy the few over the sea. 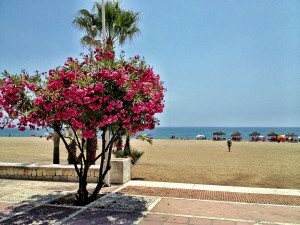 Nagüles Beach (on the picture) situated on the Golden Mile next to the Marbella Club and Puente Romano Hotels. It is 800m long and 50m wide accessed by the promenade. It is a tourist beach offering water sports including windsurfing, jet skiing, pedalos, etc. This beach has showers and public toilets, waste paper bins, vigilance towers, life saving and first aid equipment, as well as being watched over by life guards in the summer season. La Fontanilla Beach is next to the Leisure Port in Marbella offering pedalos, sun beds and parasols and beach restaurants. 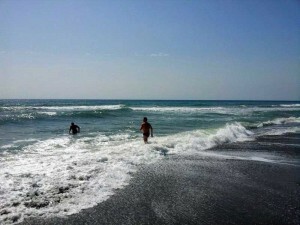 El Faro Beach is west of the Leisure Port in the very center of Marbella. It is 300 m long and 35 m wide with a high occupation level. There are two beach restaurants as well as free children’s games on the beach. 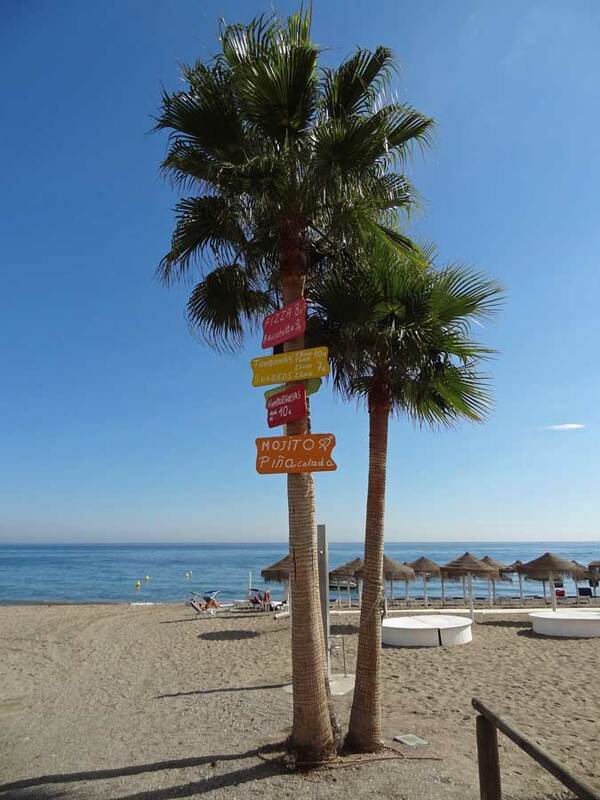 La Venus Beach is close to the Marbella Sports Port with three beach restaurants with sun beds, as well as free children’s games on the beach. La Bajadilla Beach is close to the fishing port. It is 700 m long and 35 m wide with three beach restaurants with sun beds. 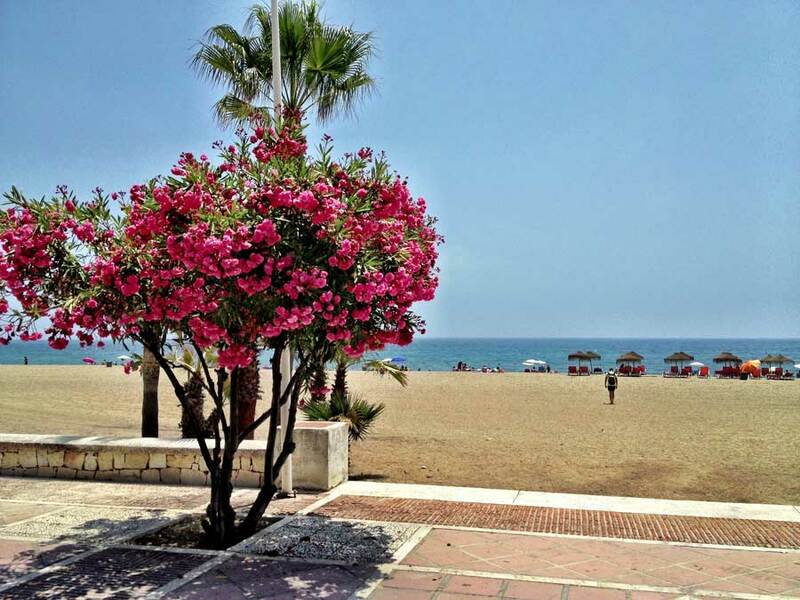 Trocadero Playa, located in Playa Santa Petronila of Marbella’s promenade, is a great example of a long established Chiringuitos with parasols, televisions, a huge wooden bar and a mouth-watering menu. 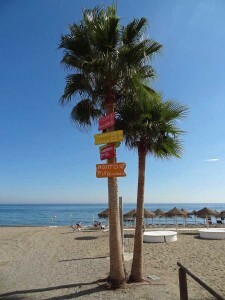 Refer to our business directory for more information about beach clubs and Chiringuitos in the Marbella area.